Today in Masonic History Timothy Bloodworth passes away in 1814. Timothy Bloodworth was an American politician. Bloodworth was born sometime in 1736 in the county of New Hanover in the colony of North Carolina. He was born to poor family and had little formal education. Despite his lack of formal education, Bloodworth held a variety of jobs in his life. Among his careers were farming, teaching school, tavern owner, ferry operator, he practiced medicine briefly, preached occasionally, was a wheelwright and a watchmaker. He was probably best known in the community as a blacksmith. He often performed services for his friends and neighbors which gained him large support from the community. In 1758, Bloodworth was elected to the colonial assembly where he was a leader for the cause of Independence from Great Britain. In 1775, he helped to organize the Committee of Public Safety in Wilmington, North Carolina. The Committees, which formed all over the colonies were grievance groups aimed at helping those wanting to resist British rule. Bloodworth developed a reputation for being harsh with British Loyalists. After the American Revolution he advocated for seizure of all Loyalist property and was appointed the commissioner of confiscated property. 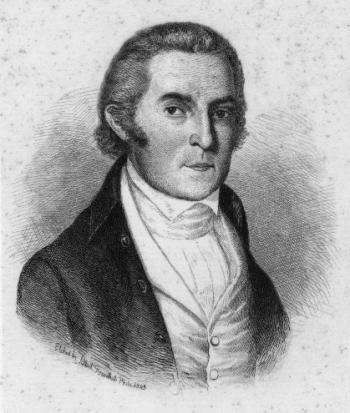 At the end of the war, Bloodworth voted against the Treaty of Paris because part of the treaty required that confiscated property be returned to Loyalists. Bloodworth became linked with a radical faction of the anti-federalists. In 1787, he voted against the new American Constitution. Bloodworth warned that the new Federal Government would overwhelm the states. He also opposed other elements of the Constitution that did not have both houses of Congress ratifying treaties. During this same time, Bloodworth was a member of North Carolina militia. He criticized the Washington administration for siding too much with Great Britain in the war against France. Bloodworth refused to seize a French vessel that had docked in Wilmington Harbor. In 1795, Bloodworth was elected to the United States Senate. He served there until 1801. Bloodworth passed away on August 24th, 1814. Bloodworth is listed as having represented St. Tammany Lodge No. 30 of Wilmington, North Carolina at the Grand Lodge of North Carolina session in 1805.